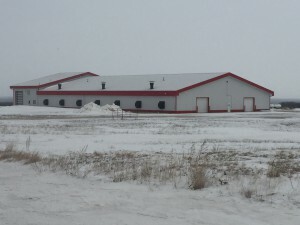 This 100′ wide x 200′ Stud wall building is located in Notre Dame, Manitoba. The building has two 50′ x 160′ Broiler barns with a 40′ x 100′ Shop space on the front which has all the mechanical rooms, wash rooms, and offices. The Shop area is set up in a way that it can also be used for loading and unloading of livestock. This project also consisted of a 60′ wide x 80′ long x 18′ tall Post frame Hay shed with a sliding door on the front.